Few days before i got a new domain for my blog, which is : www.thecodepress.info. Before if anyone will type thecodepress.info, you will be not redirected to my blog. The page will show some error. So when i tried to view my blog without WWW, the page showed error. Then i logged in to my blogger account and then clicked on view blog, then the blog was working. Again i tried it without WWW, it din't worked. I was just trying to know why it was not working without WWW. Here in this post i'll explain you the trick for making your blog to work without WWW. First you will need to buy a new domain for your blog. I bought it from Godaddy. 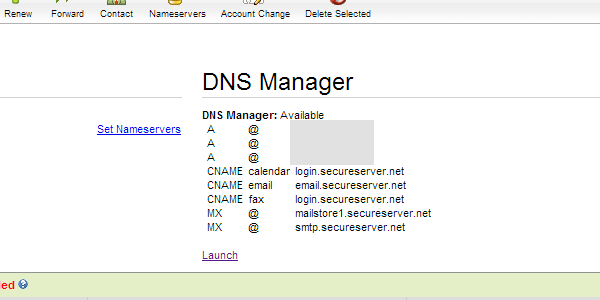 After buying it, launch your control panel and access your DNS Manager. Now, scroll little bit down and have look at 'CNAME(Alias)' table. Their will be two table head one with the title of 'Host' and another with 'Points to', now in host row search for 'www', it will be there, but if not then click on 'Quick Add' button. Now in the 'Points to' row add 'ghs.google.com' without www or http. After that go to blogger login to your account and click settings, in settings add your domain name. Now wait for few minutes, then your domain will start working. But if you will not add WWW then your domain will not redirect you to your blog. So for that follow the steps give below!. Go to your control panel and then launch your DNS settings. 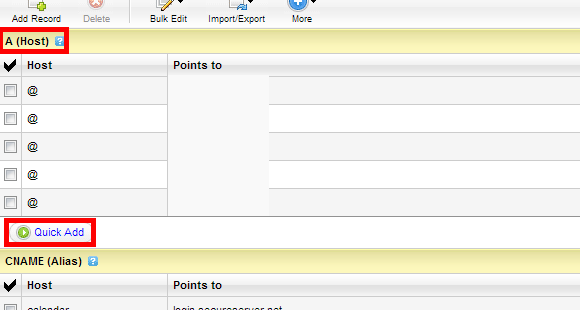 Now navigate 'A(Host)' which is the first table, now click on 'Quick Add' button which is below it. Now, After clicking on 'Quick Add', in the 'Host' row add '@' and in the 'Points to' row, add: 216.239.32.21 now create one more record with '@' and in the points to row add: 216.239.34.21, again create a new record with '@' in the points to row add: 216.239.36.21, once again do the same procedure with '@' and in the points to row add: 216.239.38.21, ok, here you are done!. Note : All IP addresses(Numbers) are different so don't use the same number for all 4 records. Now the total records you will have is 5, one which is default given by your domain provider (Don't delete that!) and the other 4 is created by you. Wait for 5-10 minutes and then check your blog without adding WWW. Also check my blog without WWW. Don't forget to like our facebook page, follow us on twitter or subscribe us!. Do you know and other way ? Yes, then share it with everyone through comment!. This is what i was finding when i bought my domain.........thanks...feeling proud to subscribe you. Thanks a bunch! Exactly what I was looking for and worked like a charm!